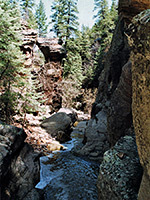 Like Sycamore and Oak Creek canyons to the northwest, West Clear Creek is one of many deep valleys that cut into the Mogollon Rim at the southwest edge of the Colorado Plateau. Most of its 25 mile length is deep and sheer sided, not as colorful or dramatic as the red rocks around nearby Sedona but still impressive enough, mainly because of the creek that flows year round and has created lengthy water carved passageways with many long pools, waterfalls, springs and narrows. It is difficult to reach, both as access is limited - long hikes and driving on rough tracks are needed just to get to the best parts of the canyon, and there are only a few entry/exit points - and as the hike itself is quite hard, requiring at least one overnight stay in the canyon and, even in summer, a lot of swimming and wading through cold pools. The reward for all this effort is a wild, scenic and unspoilt canyon which few will ever see. 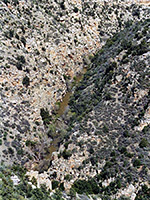 West Clear Creek flows under AZ 260 six miles east of Campe Verde amidst a wide, fertile valley surrounded by desert looking terrain with yucca and cactus - further east, the land rises to the foothills of the Mogollon Rim and the road climbs 3,700 feet over the next 20 miles through grassland, chaparral, pinyon pine woodland and finally into dense forests of fir trees, while the creek enters the canyon which then runs roughly parallel to the road to the north, separated from it by several miles of rough, uneven ground. The highway provides one access point but the usual place to enter the lower end of the canyon is a little way upstream - along road FR 618 then right on FR 215 to its end at a ranch, built just below where the creek starts to narrow and deepen a lot. The upper section has more choice since there is a large network of forest tracks around the higher reaches of the canyon, where it splits into two forks, Clover Creek and Meadow Valley. The main entrance is FR 142A, a 4WD route to the rim that starts from mile 245.5 of AZ 260, just east of the Yavapai/Coconino county line. I haven't tried any of the main approaches so instead here is a description of a route to a viewpoint over the middle of West Clear Creek, along a side drainage named Meadow Canyon. This is a reasonably large tributary and can be reached by walking or driving a short distance along a side track that heads north at mile 245.5 of AZ 260 to where the track bends right near a cattle pond, then by hiking across an open area of small bushes and boulders, and on down into the canyon, which is quite densely wooded. It is then easy to follow the valley and its small stream for several miles, past some side canyons, two fences and a couple of vehicle tracks - initially rather flat and sometimes overgrown, the creek eventually gets interesting as vertical walls of Coconino sandstone appear and the waters flow over pools, waterfalls a few feet high, flat terraces and pretty cascades. It becomes suddenly more taxing with drops of 5 meters then 10 meters, and deep pools beneath. Maybe this is easy in summer but was too hard to follow in the high water season of late spring. With a little effort, the cliffs on the west side can be climbed, and after much thick spiky undergrowth the land opens out into a wide meadow dotted with occasional trees, yucca and mammillaria cacti. A short distance north is the edge of West Clear Creek canyon, mostly quite wide but narrowing to a sheer Coconino gorge around the water level, over 1,000 feet below. This is a good viewpoint, and reachable by road, using another rough track that meets AZ 260 at mile 243, and is also a great place to camp. There appear to be some routes down to the creek but these are not very easy. The return walk to the highway takes about 2 hours; 5 hours is needed for the complete trip.